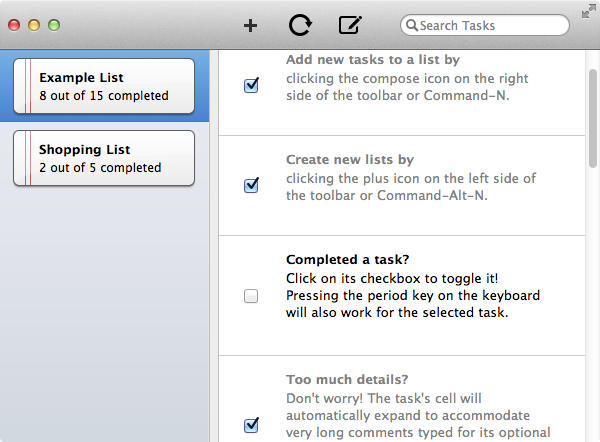 You’ve got plenty of choices for to-do-list apps, so why choose TaskAgent (Mac App Store link)? For starters, it has versions for Mac, iPhone, and iPad, and syncs seamlessly between them—enter a task (or an item for your next trip to the supermarket) on your Mac, and the item immediately shows up on your iPhone. But unlike most task and list managers, TaskAgent stores and syncs its data using plain-text files stored in Dropbox, so you can view (and even edit) your lists from any computer or device with a Web browser—no app required. Each task or list item can include a separate note, and you can search and sort your lists quickly and easily. Once a list is complete, you can choose to archive it, rather than delete it, for future reference. TaskAgent for Mac is missing a few features you’ll find in the iOS version—the app debuted for the iPhone and iPad first—and all versions have a few minor frustrations (such as not letting you use parenthesis in task/item names). But combined with its iOS counterparts, TaskAgent is a convenient and useful way to maintain simple shopping and to-do lists. And thanks to its use of text files and Dropbox, it’s also great for sharing lists with family and friends. 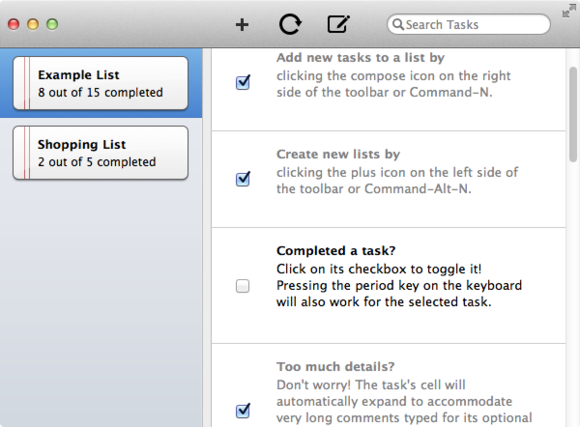 TaskAgent is an inexpensive and easy-to-use list and task manager that syncs (using Dropbox) with matching iOS apps.